I love photographing people on location with just a few small lights that can go outside at a moments notice. Now, coming from a advertising photography background and at times shooting multiple sets with 8X10 film view camera I have strobes and light modifiers enough to light up an office complex at night and have. My studio has dedicated outlets just for strobe packs. Sometimes it is necessary to have tens of thousands of watts of light available but regardless of how much power you have it is always about crafting the light and getting the most from your subject. I can’t show the recent cover shot from the Comerica Bank photography yet but using the same portable light system I did this editorial photograph. I used a single light to make this dramatic portrait Sherry King. Rather than just accepting the soft light created by a cloudy day, I was able to control the light. I could pick the light’s direction and so select the areas of clouds I wanted behind her. The light on her nicely defined her features and clothing. It equalized the brightness of the subject to the brightness of the background so I could keep good rich cloud detail. You can see I purposely let the light fall off quickly at her lower legs to hide the dirt and sticks. Not only does it hide an ugly foreground it gives a solid base to the picture while still showing she was outside. At times, you need to hide ugly details in plain sight and make them work for you. With my portable lighting kit I can move about without worrying about plug-ins or generators. I can keep in rhythm with my subject and the energy up. It is all about having and using the right tools at the right time. Will there be enough wilderness? 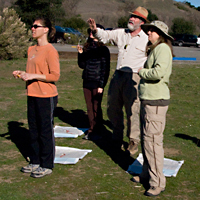 This weekend I taught a backcountry navigation class. I have been a photography educator and outdoor instructor for many years. Over the years, I have taught nature photography, people photography, backcountry navigation, and backpacking classes to teenagers through senior citizens. I presently instruct for Wilderness Outings and before that for A16 outfitters whose motto is “Leave only foot prints, take only memories” and in my case “take only pictures”. I love teaching about how to enjoy the great wilderness areas of the world in a safe comfortable way. It’s great to see people learn about how best to photograph places few ever get to experience so they can share their vision with others. 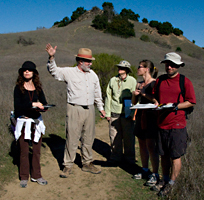 The recent navigation class teaches them how to find their way in the backcountry using USGS topo maps and compasses. Working from map to field. Is it little wonder as a professional photographer much of my present work is people portraits in their environment on location. Some of my advertising photography and video requires the control I have shooting in my studio but it is hard to beat the spontaneity that often happens on location. As I teach in my outdoor classes, it is good to approach a project with a plan and know what you are doing but also stay open to new ideas. I was recently photographing a V.P. at Comerica Bank for a magazine cover and feature story. The V.P. had a great suggestion for a very graphic location just a block away from the original location but hidden from anyone who did not know it was there. I have developed a very portable lighting kit for just such opportunities. We actually did three very nice variations around that spot. It’s great to get your subject involved; the images are much more engaging to the viewer. Pictures of the V.P. will follow after the magazine has had the chance to publish them first. I grew up spending my weekends and summers wandering the Sonoran Deserts and Rocky Mountains. My entertainment, as a teenager, was hiking with friends and photographing them. Little did I know, I was honing my skills for what I would partly do as a professional photographer and educator. I now see how very fragile earth is compared to what we can do to her. In a future blog, I will discuss how I work at protecting the environment while operation a photography studio. Can photographers keep up with the times? Now that I have introduced myself, let me talk a little about some of the topics I plan to cover in this blog. The two major areas of discussion will be photography and video. I have long felt these two areas would merge and years ago started talking to clients about adding video to photo shoots. And although there is much talk about the video capabilities of the new DSLR’s like the Canon 5D Mark ll which is a remarkable camera, photographers have been able to make reasonably good quality videos with the high resolution video setting on the older Canon G9 and even better with the new Canon G10. I love to have one of these point and shoot cameras with me at all times to catch those unexpected opportunities. Yet even with these advances the various digital still cameras leave much to be desired compared to an equally priced video camera for video especially in the area of exposure controls and audio. So I’ll be chatting about those issues and how to overcome them.. When possible while talking about equipment and techniques, I will discuss how they apply to both photography and video. I will share what tips I have and refer to others who I have learned useful bits from as well. At times, I will venture into the areas of philosophies, news, experiences and just plain thoughts on photography, video, running a business and being an image maker. I think why we do something is often more important then exactly how we do it. A quick example of this might be photographing filled out model and property releases before starting a shoot. As long as they are in focus and well exposed it doesn’t matter how you photography them. The whys are more important. First ,it reminds you to get them done. Second, you have a duplicate copy immediately. Third, you have a digital copy along with the images. Fourth, you have a digital copy that is easy to deliver with the images either on disk or FTP. This is not to say I will not share exactly how I do certain techniques. When possible, I will include pictures or video showing my methods. Please send your comments (I have comment spam filters so it might take a little while for your comment to get through) and link to anything you like on this blog. Welcome to my blog. I have been a professional photographer for over twenty years. I have created images for advertising, editorial and corporate use for clients across the United States and around the world. Narrative video has been an important part of my work during the last five years. There have been moments of personal inspiration when I knew what to create and just how to create it. Other times I have been inspired by others, always appreciative of what I could learn from their creativity and craft. I hope to share some of my personal insights and pass along information I think important from others. One of my greatest joys and an incredible learning experience comes from instructing photography classes and seminars. Preparing for them often makes me think about how I might improve my creative workflow. It makes me constantly update my thinking and look to others for the latest approaches. I will be giving information on a wide variety of photography and video issues.